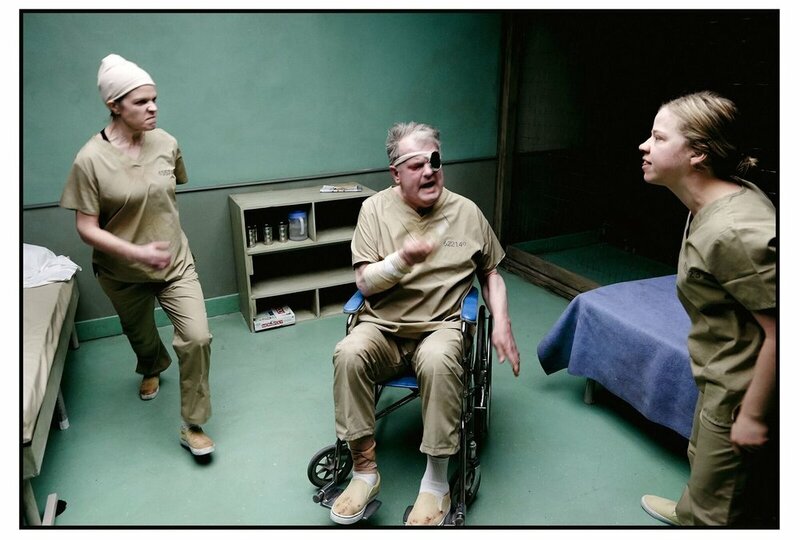 (From the press release) Two subjects, Corcoran and Filigree, are imprisoned in a human test lab and are joined by a third, Millet. Under constant surveillance by The Eye – a futuristic, multinational corporation dedicated to manufacturing the best products money can buy – the three roommates undergo sickening experiments in the name of consumer satisfaction. When not tending to suppurate wounds, burning skin and itchy backsides, Corcoran, Filigree and Millet make the best of their horrifying circumstances by telling each other tall-tales, spying on the neighbours, and trying to finish a seventeen-year-old crossword puzzle. Will they survive? Or will they kill each other first? Anna Treusch has created a institutionalized, claustrophobic, wire caged set design highlighted effectively by Gabriel Cropley’s stark, blinding white lighting design. I felt an immediate sense of dreaded foreboding in looking at the set from the intimate ‘theatre in the round’ audience seating. There are two uncomfortable looking cots on stage in opposite corners of the room with a bookcase centre, stool and a wheelchair in the other corner of the room. It appears there are two letter sized children’s drawings adorning the back wall. Keith Thomas’ sound and vocal design alarmingly made me aware The Eye was constantly watching over these three characters (and perhaps all of us). Zach Counsil’s special effects and make up design elicited gasps from some of the audience members, including myself, as the shocking context of the story line became apparent. Director Rae Ellen Bodie has clearly established a disturbing yet extraordinarily fascinating vision. If animals who are tested for product consumption and usage could talk, what would they say? Category E is a futuristic vision of human test subject scenarios where we can see and hear these people. A few years ago, I remember seeing Toronto newspaper print advertisements looking for weekend human test subjects for either drugs or a variety of other products with a high cash payout at the end of the three days. Now that I have seen Category E, I shudder in thinking what side effects those participants might have endured or endure today. Ms. Bodie has cast three powerhouse actors who grippingly command the stage with extraordinary and convincing gritty, visceral and raw performances. As newbie test subject Millet, Vivien Endicott-Douglas captures initially an unknowing ignorance about what was going to happen to her. Underneath the bravado of the savvy street wise veneer, she finely captures moments of reluctance, uncertainty, fear and horror. As the story progresses, Ms. Endicott-Douglas seizes those moments by using her voice and body to show a frighteningly gradual deterioration in Millet’s physical health through what must be horrible unseen human testing off stage. For example, Endicott-Douglas nimbly scales the bookcase to see what is going on in the next room. Gradually, this agility abates and there is a growing difficulty to breathe while culminating with worrisome body temperature changes and nose bleeds. As Filigree, Diana Bentley securely and confidently matches the physical stamina and agility required for the role. Her Filigree is intensely razor sharp in character depth and development. From where I was sitting in the audience, Ms. Bentley’s make up appeared pasty white, and this ghastly look is a shocking result and reminder of the horrors Filigree must have endured in the loss of her own individuality in human testing. Those moments where Filigree explodes on stage, given the context of the moment, are electrifying as Ms. Bentley becomes a wild animal bouncing off the wired cage set walls with controlled force. While Endicott-Douglas and Bentley can move somewhat around the set, Robert Persichini remains bound in his wheelchair for 100 minutes. An eyepatch covers one of his eyes while the other appears swollen with a crimson bloodshot redness. This staging does not hinder his performance as Corcoran. Instead, Mr. Persichini’s performance brought tears to my eyes periodically. He adeptly and adroitly utilizes the strength of his voice, while seated in that wheelchair, to reveal as stated in the Program Notes, ‘the mortifying side of people just naively accepting their menacing surroundings without question.’ Mr. Persichini’s final image is disquieting but breathtaking. Make sure to pay close attention to it. Belinda Cornish calls Category E a black comedy. The press release calls this award-winning play a ‘horror comedy’. Both terms are correct as the audience was laughing at moments that might not be considered funny outside of this world. But this one is worth seeing. Great theatre disturbs its audiences from time to time. Great theatre energizes an audience. Great theatre provides a riveting story. Category E is an astonishing play with a compelling ensemble of actors who disturb and energize while providing a riveting story. Come to The Coal Mine Theatre. Matinees are Sunday at 2 pm. No intermission. No latecomers. Call 1-800-838-8006 for ticket information. Visit www.coalminetheatre.com for further information.